The thrill of placing bets and rolling dice with a strong chance to win makes playing craps online exciting. After all, online craps is both the most exhilarating game to play and the online game with the best odds. The best winning online craps strategies start with basic bets for beginners, advanced players, low rollers, and high rollers alike. Knowing and understanding the types of bets to place in craps is a major key to success. Discover the smart bets to make and which ones to avoid. Online Craps Pro Tip: Play craps for free at the best online casinos to practice and develop winning methods to help you play like a pro before gambling for real winnings. There are a few basic things you should know before beginning to play craps at the best online casinos. 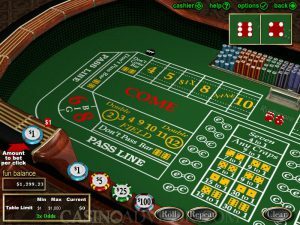 Craps requires a simple roll of the dice, yet the layout of the craps table looks complicated. Simplify it by breaking it into sections. The craps table layout has a symmetrical design that has identical side sections around the center section. The spaces, numbers, and boxes on the table guide you in developing a strategy for winning craps in an online casino. Beginning craps players should understand the following – in order – to increase their chances of winning real money. Getting Started in Craps: A shooter’s first toss of the dice is called the Come Out The goal is to roll a 7 or 11 for a win and avoid a 2, 3, or 12 for a loss. The Pass Line: Place a bet on the Pass Line when the shooter is about to roll a Come Out roll. This is the most basic place for a craps bet, and it has the best odds of beating the house. Betting the Pass Line before the Come Out roll is betting that the shooter will get a 7 or 11 on the Come Out roll or will roll the point number a second time before crapping out. More on this below. If the shooter gets a point instead of a 7 or 11, that specific number must be rolled before rolling a 7 or the player loses. On the other hand, if the shooter rolls that point number before rolling a 7, the player wins. Craps Pro Tip: The layout is designed to tempt you into placing bets that have an advantage for the house. Playing online craps to win doesn’t require cheat sheets for following a complex strategy like online blackjack does. What IS important is knowing that a house edge is connected to every bet in the game – and it varies tremendously. Knowing when the house edge is the lowest is the key for make money playing craps. For a Pass Line bet, the house edge is just 1.41%, meaning that you can expect to lose $ 1.41 for every $100 wagered. Those are the best odds of any bet on the table. In the center of the table, the house edge will range from 9.09% to 16.67%. Develop a strategy for winning craps online that matches your experience. Get familiar with the basic bets, then learn the variations on other bets as your knowledge and confidence builds. Craps Pro Tip: Take the maximum Free Odds allowed. Pass Line Bet: Beginners and advanced craps players should place bets on the Pass Line as part of their strategy to win when the shooter gets the dice for their first roll. The highest probability of winning on this bet is on that first roll, the Come Out roll. This first roll bet is an even money bet, meaning that if you bet $7, then you win $7. Come Bet: This is usually placed in the middle of a round when a point has been set and is considered one of the better bets in craps. Field Bet: The Field Bet is a single-roll bet that can be placed at any time during the game. The “Field” consists of the numbers 2, 3, 4, 9, 10, 11, or 12, so betting the Field means you’re betting that one of those numbers will come up on the very next roll. Place Bet: This is a favorite craps bet for some players and is made on any of the point numbers. Free Odds on the Pass Line: With the Free Odds on the Pass Line bet, along with the Free Odds on the Come bet (see below), you bet a smaller amount to win a larger amount. These two bets are known as the most powerful bets in craps – giving the player a great advantage. NOTE: A player is allowed to make a Free Odds on the Pass Line Bet or a Free Odds on Come Bet (below) ONLY if the player already wagered on the Pass Line bet or Come Bet. Free Odds on Come Bets: The same as the Free Odds on the Pass Line bet, but when you have already made a Come bet. Don’t Pass Line – This is betting against the shooter and the dice. It has a 8:3 house advantage on the Come Out roll. Don’t Come Bet: This is played after a point has been established and is one of the most mathematically sound bets in craps. Hardway Bets: When you place a Hardway bet, you are betting on 4, 6, 8, or 10, but you are betting they will occur through rolling doubles, thus making that number the ‘hard way’ (double 2s equals 4, double 3s equal 6, etc.). The house has a very large advantage on Hardway bets. Winning at craps the smart way means wagering bets that have a low house edge and making it even lower. Stick with what you know works. Ignore complicated and risky options, such as the following. Hedge Bets : This system combines bets and appears to reduce risk, though it actually doesn’t. Insuring the Pass Line: An example is guaranteeing that the first roll will win $15 and establishing a point at a cost of $5. ; however, the points come often enough that this becomes an expensive decision. After achieving a working, comfortable knowledge of craps, playing an online craps tournament at some of the best casinos is a good way to gain more experience. Craps tournaments are advantageous because instead of playing against the house, players typically are playing against each other. Like many online casino games, it is always smart to start by playing free craps online to gain experience, wager safe bets that are favorable to the players, decide on a set amount in your ‘bank’ and don’t bet more than it no matter what, and practice more to develop advanced strategies to increase your odds of winning real money.